The Cook’n with Class Morning Market Class starts with a guided visit to a traditional Parisian market to buy the ingredients to use in the cooking class. We met Chef Constance and she led us through the market with stops at her favorite butcher, boulangerie, cheese shop, fish monger, and produce stand. We didn’t have any recipes or a menu for what we would cook that afternoon. We visited the different shops and simply bought what looked good that day. It’s a much different philosophy than how I normally cook. I often pick recipes and menus and then buy the ingredients accordingly. In this case, the ingredients wrote the menu. When I asked Constance what we would make that day, she said she wasn’t sure yet, but whatever we made would be simple and the ingredients would shine. After finishing the shopping, we headed back to the school to get cooking. 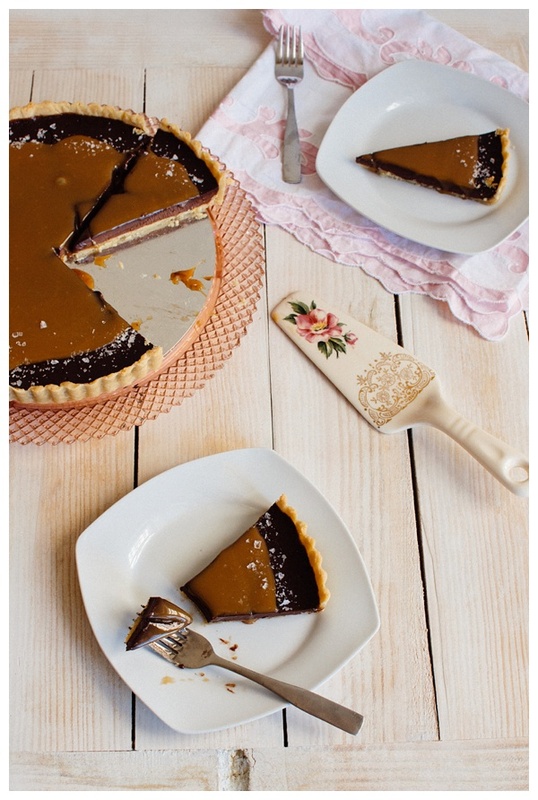 With the theme of focusing on our ingredients, Constance suggested we make a simple tart that would showcase the rich French butter and a high-quality dark chocolate that the school had on hand. 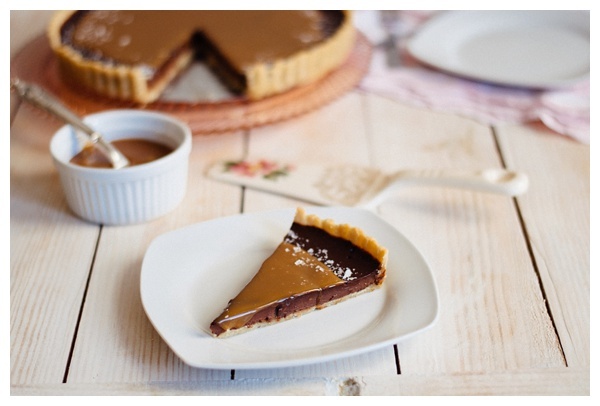 Our group decided on a classic French salted caramel chocolate tart made from a pâte sablée crust to highlight the fabulous butter, a rich chocolate ganache filling with dark chocolate and fresh cream, and a salted caramel sauce because we wanted to use even more of that butter. We garnished the tart with a sprinkle of the finest French sea salt. Constance encouraged us to keep our cooking simple. The best dishes are often the ones where the cook does little but help the ingredients shine. It was a good reminder not to overdo things, whether cooking or traveling. Thank you to Mona Quintanilla and Jess Chen for testing the recipe. Thank you to Chef Constance Deledalle and Cook’n with Class Paris for inspiring the recipe. 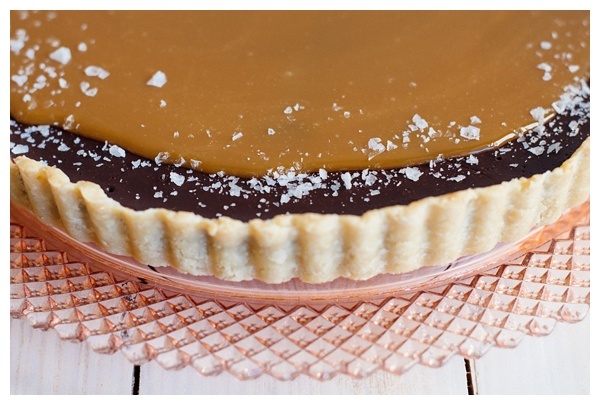 Lightly spray a fluted 10 inch tart pan with a removable bottom with cooking spray. In a stand mixer fitted with the paddle attachment, on medium speed, beat the butter until creamy. The butter will still be very cold but the texture will be creamy and just slightly fluffy. Add the salt, sugar, almond flour, egg and vanilla and mix on medium speed until well combined. Scrape down the paddle and the sides and bottom of the bowl. Add about 1/3 of the all-purpose flour and mix on low speed until just combined. Scrape down the paddle and bowl. Add the rest of the all-purpose flour and beat on low speed until just combined. It may take a minute or two but it will eventually come together into a crumbly mixture. Scrape down the paddle and the bottom and sides of the bowl and check for any dry pockets of flour. If there are large dry areas, mix for another 30 seconds or so. Turn the mixture onto your work surface and gently gather it into a small mound. You don’t have to rush, but work quickly to prevent the butter from getting too warm. Using the heel of your hand, push a section of the dough away from you and smear it across the surface of the counter (this is a technique called fraisage and it helps to blend the butter into the dough). Use your hand and continue smearing sections of the dough outward until what was once a mound of dough is now completely flat and smeared across the table. You want it to lose the crumbly appearance and look more like supple dough. The edges should no longer be crumbly, but if they are, repeat the smearing process again. Use a bench scraper to gather the dough back into a mound. Grab a large chunk of dough and press it evenly into the bottom and up the sides of the tart pan. Continue adding small pieces of dough and patching and pressing the crust together until the entire bottom and sides of the tart pan are covered as evenly as possible. I like to be generous in the amount of dough I press up the sides because I find it help support the tart. The dough on the sides should reach just over the top of the pan. If there are any thin spots, use pieces of the remaining dough to patch them. You may have some dough left over. 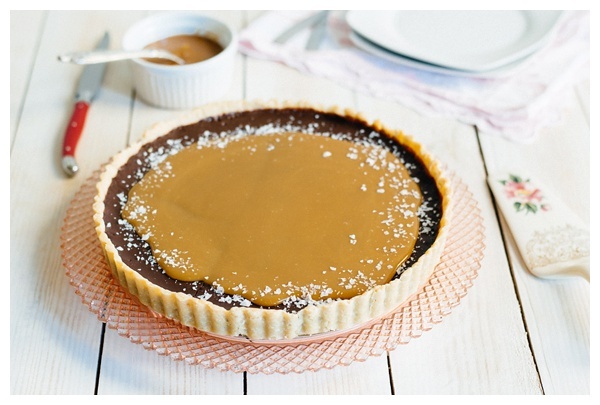 Run a rolling pin directly over the top of the tart shell to cut the dough and create an even edge. Remove the loose dough pieces and discard. Use a fork to gently poke holes all over the bottom and up the sides of the crust. Place the tart pan on a baking sheet. This helps to prevent accidentally knocking the bottom when taking it in and out of the oven. Line the tart shell with parchment paper and fill it to the top with pie weights or dried beans. Refrigerate for 30 minutes. 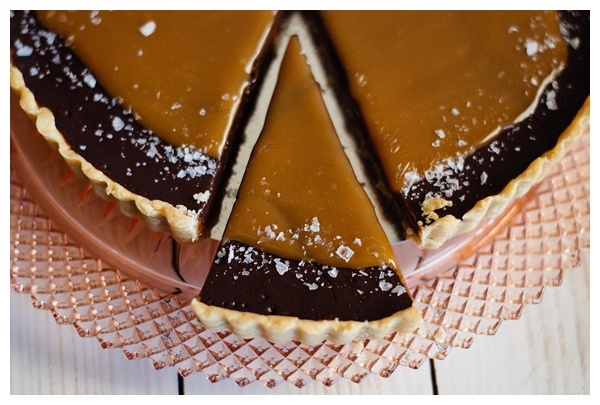 (You can even make the caramel during this time, if you want). While the crust is chilling, preheat the oven to 325 degrees and position a rack in the center. Bake the tart shell for 25 minutes. Remove the parchment paper and pie weights and bake for 5 more minutes or until the crust is dry and light golden brown in color. This process is called blind baking and simply lets the crust bake for a bit before adding the filling. Since we won’t bake the chocolate filling for long, we bake the crust on its own to ensure its thoroughly baked. Carefully pour the sugar into a medium heavy bottom saucepan, taking care not to get sugar on the sides of the pan. Lightly sprinkle the water over top of the sugar, making sure not to splash sugar on the sides of the pan. If there are sugar crystals on the side of the pan, use a clean pastry brush dipped in water to brush them away. Bring the mixture to a boil over medium-high heat and let the sugar dissolve and cook without stirring. I know it’s hard, but avoid the temptation to stir and let the boiling do the work. If the sugar is cooking unevenly, lift the pan off the heat and gently tilt the pan and swirl the sugar to blend. Continue to cook the sugar until it begins to darken and reaches a straw color. Reduce the heat to medium and let the caramel cook a few more minutes until it reaches a deep amber color or just begins to release wisps of white smoke. Be sure to watch carefully because it can burn very quickly. If you’re having trouble discerning the color of the sugar, dip a spatula into the mixture and drip some of the sugar onto a white plate. You’ll be able to see the exact color. Remove the sugar from the heat and slowly stream in the warm cream. The mixture will bubble and sputter so stand back and be careful. Once the cream is incorporated, carefully whisk in the butter, vanilla extract, and salt. The sauce should be smooth but if there are some lumps or hard bits, put the pan back on low heat and stir the caramel until it is smooth. Place the chocolate and salt in a medium heatproof bowl. In a microwave-safe measuring cup, microwave the cream, milk, and espresso until they reach a boil, about 1 minute. 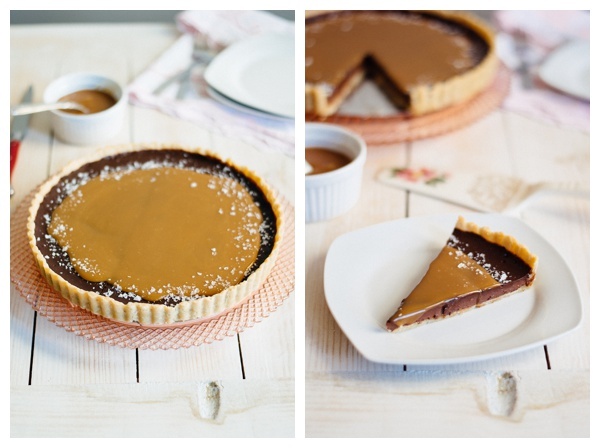 Carefully pour the chocolate filling into the pre-baked tart shell and bake until set and slightly puffed, about 25 minutes. It will still be slightly jiggly in the center but will firm up as it cools. Let the tart cool to room temperature before slicing. Serve the tart at room temperature. Garnish each piece with a generous drizzle of salted caramel, a pinch of sea salt, and a scoop of whipped cream or vanilla ice cream. Be cautious when working with the tart pan. The bottom is removable and it is easy to accidentally grab the pan from the bottom and have your tart fall out onto the floor. I recommend placing the tart pan on a baking sheet and using that to move it in and out of the refrigerator and oven. [br][br]Storage[br]The prepared tart can be lightly wrapped and kept in the refrigerator for 2-3 days. [br][br]Make Ahead [br]The crust can be made 2-3 days ahead and covered with plastic until ready to use.